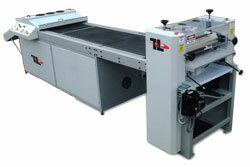 Graphic Systems Services Inc - Pre-press and post-press printing equipment. 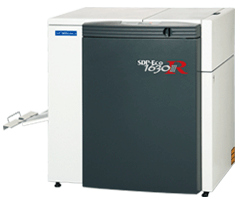 The efficient, environmentally friendly SDP-Eco1630IIIR platesetting system features a patented, self-contained processor that operates with two ready-to-use solutions for imaging Silver DigiPlateTM paper or polyester plate materials. This CTP platesetting system uses up to two-thirds less chemistry and produces precisely the right plate for every job – one color, two–color or process color. 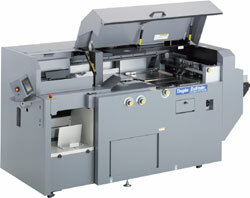 Mitsubishi's SDP-Eco1630IIIR is a completely automated, digital platesetting system. Versatile and cost-efficient, the SDP-Eco1630IIIR is designed to increase your CTP capabilities, while decreasing your chemistry consumption and costs. Tec Lighting is proud to present its Tec UV Roller Coater System The XtraCure. This system consists of an offline UV flood coater/UV dryer which offers the performance and capacity to apply a high gloss UV coating finish to a wide array of substrates. The XtraCure is designed as a hand fed coater but can be customized to an automatic fed system. Our Durable Design and state of the art engineering allows for years of optimal performance and reliability while offering reconfigurable stand mounts for maximum versatility. • Offline Hand Fed UV roller coater. • 11 Ft. and 14 Ft. standard UV conveyor lengths. The 52 series with optional perfecting mode and a full range of features for ease of operation, high quality and performance and quick make-ready devices is the perfect machine for short and long run production. The features include touch-screen operation, on the run plate cylinder-, ink sweep- and damper rollers adjustment, and a comprehensive error detection system. Options include automated ink roller cleaning and blanket wash up devices and remote plact cylinder cocking as well as swing-away numbering and perforating unit (for low pile model), automated changover to perfecting and CIP-4 compilant remote operation console. The Shinohara 52 Series machines are all-purpose tools for small and medium printing houses, which demand highest quality, top performance and easy, menu-driven operation. The high automation level and complete equipment predestine the machines for all kind of print products, even packaging up to 0,4 mm. The unique construction with one-piece casted foundation (up to 4-colour-press) gives outstanding stability and constancy for long years, even at the high speed of more than 15.000 sheets/hour. World's fastest 17,000 SPH printing speed with large sheet width.Revolutionary technology offers advanced business strategies to meet a variety of the industrial demands. The rigid, monocast turnover cylinder uses a patented master/subgripper system to offer precision, speed, and high reliability in single- or double-sided printing. Semi-automatic changeoverPerfecting System. Switching from straight to perfecting printing, and vice-versa, is a simple matter in fact, complete perfecting changeover takes only about a minute. The semi-automated changeover system uses a safety monitor to guide operators through three easy steps, resulting in higher operator efficiency and greater throughput. Shinohara presses (66 and 75/79 series) use 7 O'Clock cylinder alignment (plate, blanket and impression cylinders), preventing the gap shock marking. 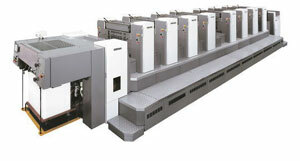 Developed with the aid of computers, this superior cylinder layout also assures better ink distribution and ink film thickness. Duplo redefined the word automatic with the introduction of the System 5000 Collating and Bookletmaking System, the first finishing machine to deliver cutting edge technology at unprecedented speeds of up to 5,000 booklets and 9,800 collated sets per hour. 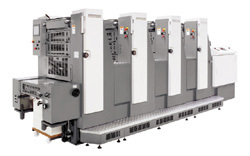 Incorporating up to six high-speed DC-10/60 Pro suction feed collators in-line with the fully automatic DBM-500/T Bookletmaker and Trimmer, the System 5000 remains the most productive and technologically-advanced collating and bookletmaking solution in the industry. Fully loaded with a wide range of first-rate features, the System 5000 will enable any novice to produce books in a matter of minutes. The System 5000 also incorporates a redesigned fold unit, providing a flatter, crisper fold, thus making booklets easier to manage when being fed into envelopes inserting machines for direct mail applications. 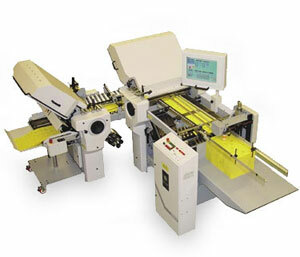 The machine also addresses booklet variation and has a job interruption system which diverts corner or side-stitched jobs to a separate catch-tray, while other jobs continue to pass through the trimmer onto the belt-stacker for collection. The high speed and precision engineering of the DPB-500 Perfect Binder makes it the most productive and cost-efficient perfect binder in its class. The fully automatic and single clamp design allows output of up to an impressive 525 cycles per hour. excellent bound strength and lay ?? at properties. built to last through all your perfect binding demands. 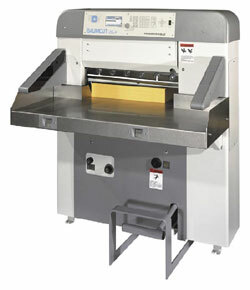 The Baumcut 26.4 programmable cutter is efficient, compact, and easy to operate, with minimal maintenance. This heavy-duty, fully-hydraulic cutter features easy push-button programming and stores up to 99 programs with 6464 cut steps. The Baumcut 26.4 offers high-productivity precision cutting with maximum safety in mind. Infrared safety beams, two hand timed cut release and covered rear table help ensure operator safety. Noise levels are kept to a minimum since the motor runs only during cutting operations. Programming is automatic. Simply cut the first ream manually, and the cuts are stored as a program. A large central LC display indicates data in the selected language. Knife changes are easy, with a front adjustment. Built-in table light and optical cutting line indicator yields more precise cutting. AutoSet combines the information of the Baum ifold with automation to provide an affordable and informative solution for your folding applications. AutoSet improves your folding capability, productivity, and is a full-time aid to all of your folding questions.